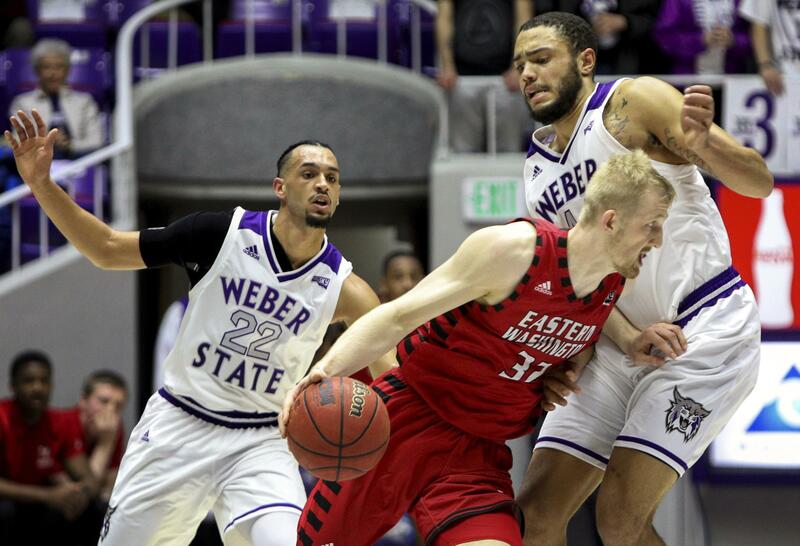 OGDEN, Utah – Bogdan Bliznyuk scored 27 points, 19 in the second half, and Eastern Washington beat Weber State with a 75-70 victory on Thursday night that ended the Wildcats’ nine-game winning streak. Jerrick Harding’s basket had Weber State within three with nine seconds left but Bliznyuk, who came into the game having made 63 consecutive free throws, sank his only two attempts of the game with five seconds remaining. Bliznyuk moved into third place for single-season consecutive makes, one out of second and eight from the mark held by Gary Buchanan (Villanova, 2000-01). Bliznyuk now has 1,996 points with three games remaining in the Eagles’ regular season. The Big Sky career-scoring record is held by Idaho’s Orlando Lightfoot with 2,102 points. Jerrick Hardin scored 17 points to lead Weber. Brekkott Chapman notched 15 points and Ryan Richardson scored 14. The Wildcats are now 6-30 all-time at Weber State. Published: Feb. 22, 2018, 8:50 p.m. Updated: Feb. 22, 2018, 9:57 p.m.